The current OCAD 12 Service Update contains an interesting new feature for MTBO maps. If you want to draw a MTBO map and if there exists already an orienteering map, you can easily create the MTBO map on base of the orienteering map. Open the orienteering map and load the colors and the symbols from a MTBO map. Press the Shift key while you are clicking on Map -> Load Colors and the Symbols from…. 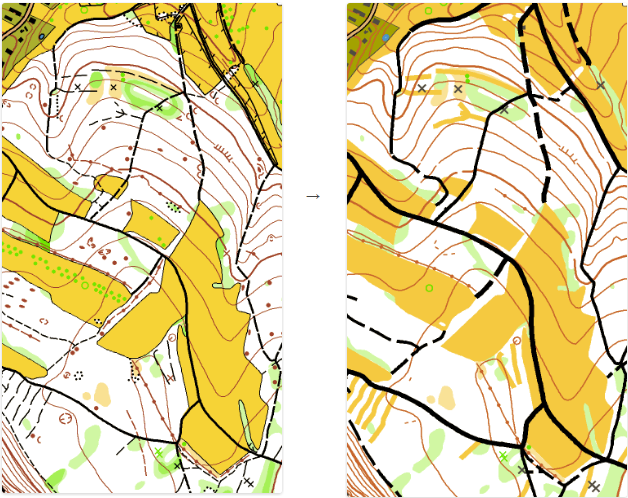 Choose the Orienteering Map ISMTBOM2010 in the same scale as your orienteering map is. Press the Shift key and click on the Load button. 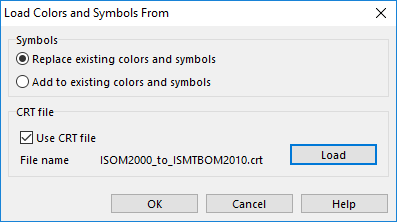 Choose the CRT file ISOM2000_to_ISMTBOM2010.crt. The foot orienteering symbols are changed to the mountain bike orienteering symbols. Perhaps not all of the symbols are known in the MTBO map, because the mapper added new symbols in the orienteering map. These objects have to been assigned. To check if you have objects with unknown symbols click on Select -> Select Objects by Symbols -> Objects with Unknown Symbol. Clean up the map from unused objects (e.g. slope lines of form lines) and check the classification of the path and track network in the terrain. This entry was posted in OCAD 12 and tagged OCAD 12, Orienteering Map Making on October 5, 2016 by OCAD Team. Slope lines of form lines still appear on the map sample. So I recommend to use two separate slope line symbols – one for contour lines and other for form lines. After that is’s easy to hide slope lines of form lines or edit CRT file accoring to additional symbol. Yes, cleaning up the map is still necessary. And thanks for the recommendation. Which OCAD12 products include this functionality (Professional/Orienteering/Starter)? This functionality is in Professional and Orienteering edition, not in Starter. That’s a mistake in the Trial installation. We have fixed that in the meantime. So this function works now also in OCAD 12 Trial.